The pharmaceutical sector, once considered the domain of prescription pharmaceuticals, has evolved to encompass therapeutic products ranging from potent over-the-counter products to relatively unregulated products such as medical marijuana and botanicals. This review focuses on pharmaceuticals in the traditional sense with a brief look at sectors that have developed at the edges. While studying product approvals can tell us about the past and the present, it is transactions and technologies that that provide greater insight into what we can expect in terms of product development and approvals over the next decade. What stands out when looking at 2017 transactions is the industry’s preference for sooner rather than later and reduced risk. This explains the relatively large number of Product Deals and Company Acquisitions, even as they become increasingly expensive. Product Deals led all 2017 transactions with a 35% share, followed by Pharma Service Deals (23%) and Company Acquisitions (16%). 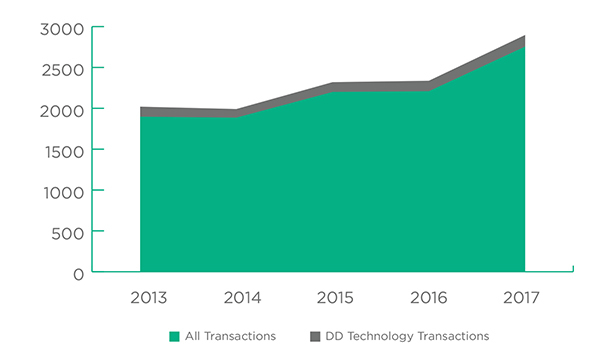 Drug Delivery Technology deals, transactions largely catering to “do it yourself” companies, followed with 141 recorded transactions and a 5% share. This 5% share for Drug Delivery Technology transactions in 2017 is consistent with the figures for the past five years although it has dropped somewhat from 6% five years ago. Beyond the more obvious attention-grabbing acquisitions of product rich emerging biopharma companies, J&J/Actelion ($30 billion) and Gilead/Kite ($12 billion), there has been a roll up of companies in the diversified pharmaceutical and pharma service sectors. 2017 saw Abbott acquire St. Jude ($25 billion), Becton Dickenson acquire C.R. Bard ($24 billion), Thermo Fisher acquire Patheon ($7.2 billion) and Lonza acquire Capsugel ($5.5 billion). This is consistent with a decade long series of acquisitions in the Pharmaceutical Services sector where companies have invested in establishing leadership positions and critical mass. One interesting trend in 2017 was the announcement of a half dozen drug delivery and formulation agreements involving cannabis. Cure Pharmaceutical announced a pair of deals with CannaKids and the Technion-Israel Institute of Technology that involved cannabis formulations and the investigation of cannabis related products and formulations for the treatment of cancer. Delivra, Dosecann and ARA-Avanti Analytics announced a collaboration to develop a range of novel formulations for the medical cannabis market. Revive Therapeutics announced a pair of academic partnerships for cannabis related products as well as positive preclinical results using tannin-chitosan hydrogel formulations of cannabidiols applicable to topical gels, creams and ointments as well as transdermal patches. Additional cannabis related deals announced in 2017 included Pivot Pharma’s acquisition of Solmic’s Solubilisation Technology for application to cannabinoid containing extracts, and quite tellingly GW Pharmaceuticals reacquisition of Sativex commercialization rights in the USA. The progressive legalization of cannabis related products presents a significant challenge and possibly an opportunity for the pharmaceutical industry. Despite the approval of medical and recreational cannabis in several U.S. states and its impending full legalization in Canada, the U.S. Drug Enforcement Agency still has marijuana and cannabis listed as Schedule I products. This creates the perverse situation where cannabis related prescription products, despite being tested for efficacy and safety, will be subject to much more restrictive use than any number of medical marijuana formulations. The low cost and low risk development of non-prescription cannabis-based products, may help explain Otsuka’s decision to return U.S. rights for Sativex to GW Pharmaceuticals. Is the expense of development and regulatory filing recoverable when a product will be competing against non-prescription cannabis formulations that may offer more choice in terms of formulations and delivery routes? Beyond the cannabis segment the only other notable drug delivery and formulation technology area seeing strong transaction activity in 2017 was the cell and gene therapy sector. Whether this can be considered a drug delivery or formulation play is questionable, at least at this stage. Most notable was Gilead Science’s acquisition of Kite Pharma for almost $12 billion. There were also a number of transactions in 2017 where Big Pharma companies secured access to viral vector systems. Cell and gene therapy is an area where things are starting to heat up in terms of technologies and transactions with the prospect that once proof of concept is firmly established there will be considerable opportunity for more capable and refined technologies capable of providing competitive advantage and strong intellectual property positions. The only significant traditional type of drug delivery and formulation transaction was announced late in the year with Alexion’s licensing of Halozyme’s Enhanze technology for application to a total of four targets. The terms were a usual multimillion dollar upfront ($40 million) with additional payments of up to $160 million per product and a mid-single digit royalty. The past year reinforced the argument that pursuing drug delivery and formulation technology out licensing deals is not a first choice corporate development strategy. Any significant success achieved by companies with substantial drug delivery and formulation technology assets has come from developing their own pipeline of products for commercialization or out licensing to hungry Big Pharma and Specialty Pharma companies. As of March 2017, PharmaCircle had identified a total of more than 6,400 different drug delivery and formulation technologies intended for application to prescription and over-the-counter medications, of which some 4,800 were active. Of the 4,800 active technologies only 2,819 are associated with one or more identified products. The remainder, about 2,010 technologies, largely disclosed in patents, publications, posters and press releases are yet to take the next big step into the development process. The balance of this article relates to the 4,800 Active Technologies irrespective of whether they are or aren’t yet associated with a product. 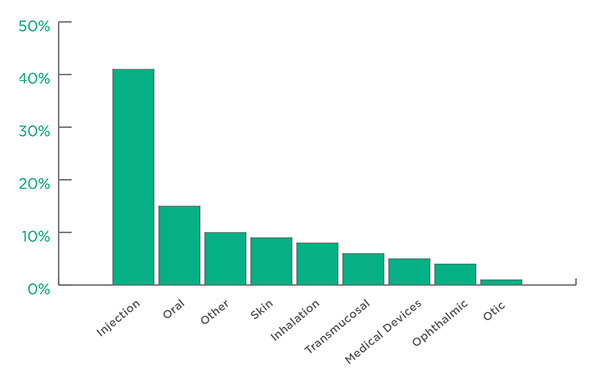 In terms of Drug Delivery Categories, Injection (41%) and Oral (16%) represent the two largest groups of applications for Active Technologies. 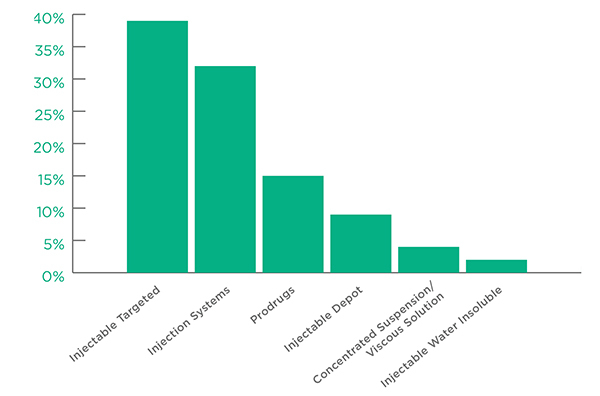 The leading active Injection Technologies were Injectable Targeted and Injection Systems, which together accounted for more than 70% of all technology applications. Injection Systems refers to a wide range of injection options including autoinjectors, prefilled syringes, infusion pumps and needle free injectors. Among Oral Technologies the leading applications were Oral Modified Release followed by Oral Enhanced Bioavailability. 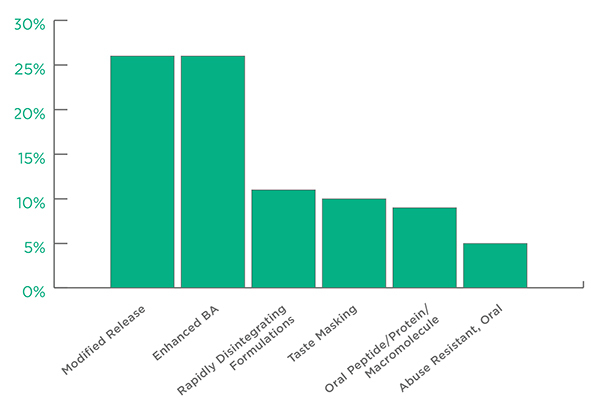 Abuse Resistant, Oral technologies came in at a perhaps surprising 5% of the total. The remaining technologies, including effervescent, lozenge and chewable, accounted for 13% of the total. In the expanding sector of gene and cell therapy, PharmaCircle has identified a total of 233 active drug delivery and formulation related technologies, including viral vector and nonviral nanoparticle systems. The rapidly expanding gene and cell therapy sector suggests we will be seeing a whole new set of technologies that meld traditional pharmaceutical sciences with molecular biology. More difficult to understand is the number of technologies applicable to the burgeoning pipeline of cannabis related products. These products straddle the areas of prescription and a less restrictive over-the-counter type status, making it hard to properly identify actual technologies and products. Companies developing nonprescription cannabis-based products may prefer to seek trade secret protection rather than the disclosure required for patent filings. In the end it is most likely that cannabis will largely make use of the substantial knowledge base and technologies applicable to similar small molecule actives. One hopeful sign is the early Phase 3 results with Novo Nordisk’s NN9924 Oral Tablets, an oral formulation of their injectable GLP-1 analog, semaglutide, a peptide weighing in at 4.1 kD using Emisphere’s Eligen technology. Dosing requirements for type 2 diabetes mellitus are much higher with the oral formulation, about 10 mg per day versus 1 mg per week for injectable semaglutide (Ozempic). Nonetheless, if shown to be safe and effective Novo Nordisk’s NN9924 promises to shake up the GLP-1 injectable market and deliver Emisphere major validation after some 25 years of technology development. Reviewing 2017 drug delivery and formulation transactions and technology developments provides little evidence that the immediate future holds anything more than incremental advances down already well-traveled paths. The pharmaceutical industry is still in need of technologies that make possible the oral administration of macromolecules like insulin, cytokines and antibodies, and more selective tissue targeting. Without a significant breakthrough the industry will be limited to marginal improvements in delivery systems and devices offering patients enhanced convenience, if not objectively improved product performance. Perhaps the new generation of immune-oncology products will demand a new generation of drug delivery and formulation technologies. Delivering on that will take an investment of time and resources.